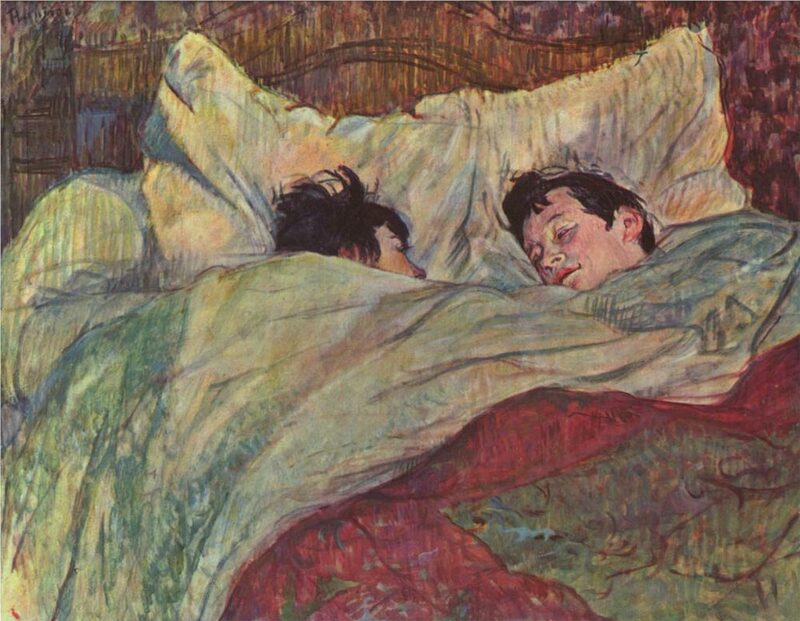 In Bed by Henri de Toulouse-Lautrec is a post-impressionism oil painting created on cardboard. It was completed in 1893 and is now on display at the Musée d’Orsay gallery in Paris, France. Henri de Toulouse-Lautrec is one of the most famous painters of the post-impressionist period. His paintings sell for millions of dollars today and In Bed is one of his most famous. This painting shows two people lying in bed next to each other while gazing into one another’s eyes. The woman is on the left while the man is on the right. Blankets up to her cheek and nose cover her face. The man’s face is covered up to his chin. Both are lying on pillows and facing toward each other. The sheets and pillows are white while the headboard behind them is brown. There is also a red blanket over the sheets that can be seen at the bottom of the painting.